NASA’s four Magnetospheric Multiscale Satellites launched atop an Atlas V last week have begun initial commissioning activities, going through health tests and each deploying two magnetometer booms, the shortest booms to be deployed over the six-week initial commissioning phase that will be followed by about four months of instrument checks and calibration. Following their thundering liftoff atop Atlas V on March 13, the four stacked MMS satellites enjoyed a flawless ride into orbit initially powered by two Solid Rocket Motors that later separated from the Atlas booster that itself made way for the Centaur Upper Stage, tasked with two burns to insert the four satellites into their preliminary orbit. Orbital insertion was precisely on target and Centaur was also very accurate when spinning each spacecraft up to 3RPM during the complex separation sequence that was carried out to perfection as Centaur deployed the four satellites into a tight group. After the conclusion of Centaur’s mission, the Upper Stage vented its propellant tanks, leaving a visible cloud in the sky that was seen from a large region in North America. With the four spinning satellites on their way and talking to the ground via the Tracking and Data Relay Satellites, the Mission Control Team at NASA’s Goddard Spaceflight Center had their work cut out for them – commissioning each satellite and all its systems, adjusting the orbit of the constellation and bringing the satellites into a precise formation. This process is expected to take up to half a year and started with an initial health poll performed on each satellite after launch to verify that all core systems were operational. 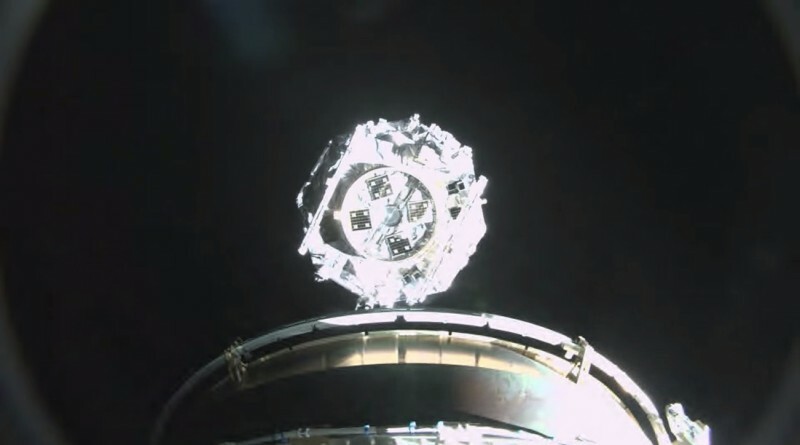 About seven hours after launch, the four satellites primed their propulsion systems by making short pulses with their engines to provide data on the functionality of the prop system ahead of the start of orbital adjustment maneuvers. All four satellites have made small adjustments to their perigee altitudes, beginning the process of raising their perigee from the initial 550-Kilometer altitude to the operational 2,550 by 70,080-Kilometer orbit where the spacecraft will spend their first year. All instruments of the FIELDS package (magnetometers, Electron Drift Monitor, Double Probe Instruments) were activated and have shown nominal electronics performance. Initial Deployment Operations started with the magnetometer booms and the Receiving Elements of the Axial Double Probes. The two magnetometer booms were deployed by unfolding the rigid boom segments along hinges using loaded springs until being latched in an extended position. Five meters in length, these booms reside on opposite sides of the spacecraft and fulfill the purpose of moving the magnetometers away from the magnetic field of the MMS spacecraft that would compromise the extremely accurate magnetic field measurements made by these sensors. MMS carries an Analog and Digital Fluxgate Magnetometer that use the same measurement principle but completely different and independent electronics and data readout techniques. 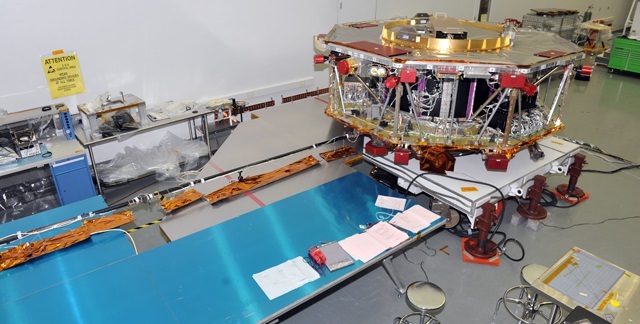 Given the importance of the magnetic field measurements in the science goals of the MMS mission it was important to include two different instruments to guarantee magnetic field measurements will be available, even if one type of magnetometer fails. A search coil magnetometer is also installed on one of the Magnetometer Booms to deliver data on the magnetic fluctuations along a broad frequency range. 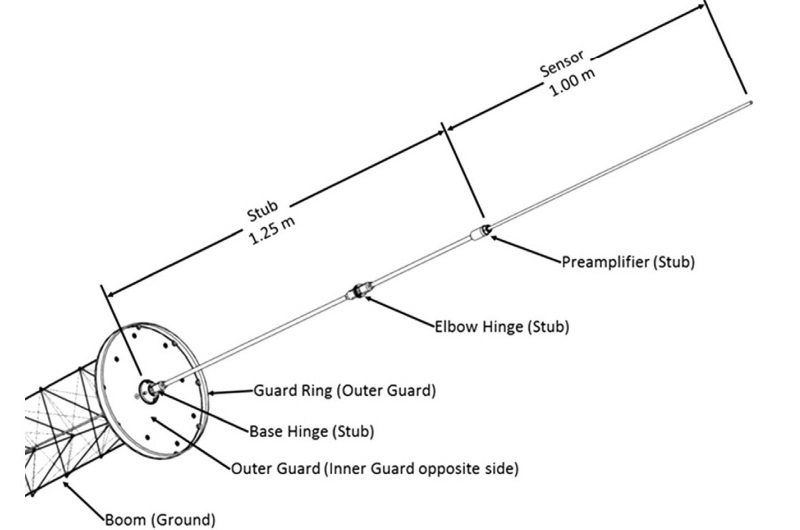 The other deployment was the Receiving End of the Axial Double Probes of which there are two per spacecraft, operating in concert with the four wire-boom Spin Double Probes to make measurements of the three components of the electric field. The 15-meter long axial booms consist of an extendable boom that is stowed in a container for later deployment and a double-hinged 2.25-meter receiving element which includes a 1.25m stub, pre-amplifier and one-meter long sensor. In the stowed configuration, the extendable boom is coiled inside of a canister while the receiving end was folded on the base and elbow hinge and held in place by two launch latches. The latches were opened by high-output paraffin actuators pushing the release mechanism over center to cause the simultaneous release of the latch arms. The tip latch released first followed by the elbow latch and redundant springs in each hinge delivered the strain energy needed for the deployment of the receiving end. The hinge springs hold the hinges against a hard stop in the fully deployed configuration, preventing any flexing during routine spacecraft maneuvers. 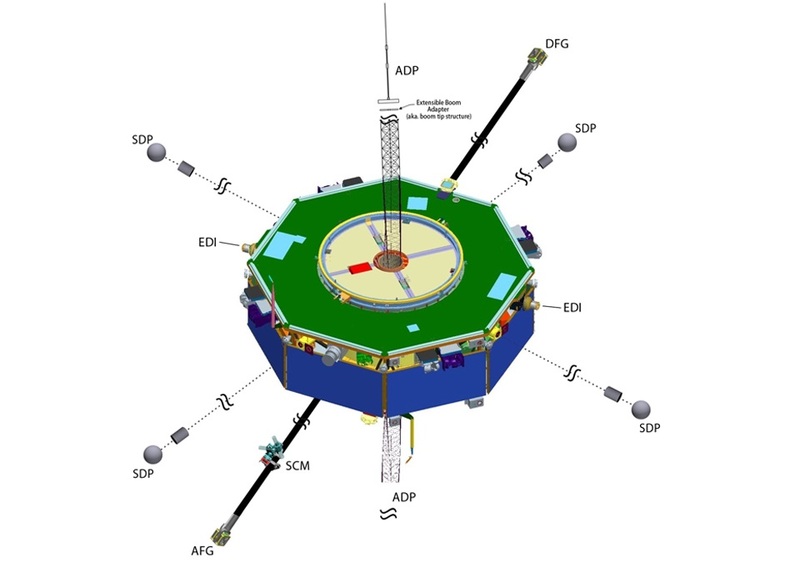 The four wire booms for the Spin Double Probes will be deployed next, taking a longer period since the spin rate of the spacecraft is varied for the different deployment stages of the 60-meter long booms. Last to deploy are the extendable Axial Double Probes.